Dear Dr. Freelance, I am a rookie soon-to-be freelancer based in Europe who’s wondering how much to charge for Twitter ghostwriting. The background: I am currently finishing a webdesign/copywriting project for a small software startup. Since they are both colleagues of mine and they were offering me the chance to collaborate on future projects, I gave them a 30% discount on an already very conservative estimate. Still, it was quite a lot of money for them. Now, to get their Twitter account going, they asked me to write 20 tweets for them. They intend to write their own tweets in the future, so some kind of monthly “flat-rate” arrangement won’t work. How much should I charge? Of course, knowing the two guys and having written their website copy I’m familiar with their “voice,” but I’d still have to do a bit of research for at least some of the tweets. But given your circumstance as someone new to the industry, I think you need to start by answering an essential question: How much do you want to earn writing per year? 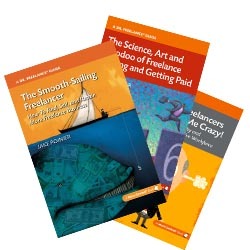 I’m unaware of any German-specific data, unfortunately, but Jenn Mattern’s AllIndieWriters.com has a handy freelance hourly rate calculator that allows you to crunch the numbers in Euros. Time for uploading, monitoring responses, and replying to retweeters, etc. If you can get a decent price, my goal would be to make it so easy for the client, and drive such positive results, that they’d want to extend the project—perhaps then at a flat monthly rate. Good luck with it, and welcome to the world of freelancing! Freelancers: Do you have any tricks of the trade to share about ghostwriting for Twitter or other social media? Please share them in the comments! Your recommendations make sense… I’d also add that writing short as in 140 characters is a specialized skill – to do it well that is. This is an interesting question. I’ve been asked to compose tweets on behalf of clients, but have always declined because I thing that, in order to use Twitter appropriately for business, it needs to be managed by someone *there* who can post several (or at least a couple) times a day. I’ve never thought about charging per tweet, only about including it as part of a flat rate package. Your advice is good, though, as this would be an easy service to undervalue. I totally agree, Dava. I think the risk is just pumping out some tweets and then no followup. Heck, I have a hard time keeping up with Twitter on my own account…though I suppose I’d change that if I were getting paid for it rather than cutting into my paying-project time. I charge on a monthly basis but get to know my clients and their activity really well before taking on the work. You need to project the correct tone of voice for the brand/company/person and make sure your facts are 100% correct! You should also have an overall strategy for both Twitter and Facebook as how you use them should differ greatly. Social media is very time consuming and yes, each tweet or status update has a short shelf life – that is why it’s crucial to get each one correct in order to add value to your client’s business or brand. Not a job to be left to a newly graduated student who does not understand the importance of brand equity and reputation; a job that an experiened brand builder should take on. Thanks for commenting, Lisa. Excellent point about having a big-picture strategy!